In early January 1966, I decided that I would join the Navy instead of being drafted. The recruiter noted on my enlistment papers that I desired to be a Reactor Operator in the Submarine Service. 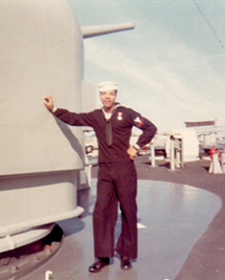 On the afternoon of 06 Jul 1966 after processing at the Armed Forces Examining Station (AFES) in Philadelphia, Pa., I was placed on a train for naval recruits whose destination was the Naval Training Center Great Lakes (about 35 miles north of Chicago) for Basic Training. Electronics Technician (ET) “A” School followed. Being an ET was a prerequisite for Reactor Operator. Sometime during the winter of 1966-1967, more than 60 inches of snow fell nonstop over a few days in the area—Chicago was paralyzed. I had never witnessed a snowstorm of that magnitude and hope that I never will again! On 21 Jul 1967, I completed ET Schools and specialized in maintenance and repair of air- and surface-search radars. My rating was changed from ET to ETR (Electronics Technician Radar). On 17 Aug 1967, I reported aboard USS Willis A. Lee at its homeport in Newport, R.I. because classes at the Nuclear Power Schools were full. The weather was great, but in about 6 months, I would get a taste of the cold weather that was typical for winters in the Narragansett Bay area. I was delighted when I learned that ET ratings did not stand any “routine” watches aboard the ship. Nonetheless, I was assigned a Quarterdeck Watch within a few days after reporting aboard but never stood another. Maybe the captain suspected that this 20-year-old kid with a loaded 45-cal. pistol was more dangerous to the ship and the entire naval base than any perpetrator would be! After I settled in, I brought my newfangled “transistor” record player aboard along with plenty of albums and “45s.” I remember getting into a discussion with the Electrician’s Mates about electrical safety with the record player. Personal equipment must either have a built-in transformer at its AC input, or it must be used with a separate isolation transformer. My record player had one built-in. Mike Bugara, an Electrician’s Mate, might have been involved in that discussion, but I did not realize that he was aboard at that time until I joined the Destroyer Leader Assn. (DLA) about 4 decades later and met Mike. Learning my way about the ship took a while. Equipment associated with the three radars for which the ETRs were responsible was scattered throughout the ship. This equipment was designed to be rugged. We needed only to calibrate the radarscopes on the day before leaving a port if they had been de-energized or monthly during continued operation. I also spent plenty of time in the Boiler Rooms and Engine Rooms because I was curious as to what made the ship tick! I gained an abundance of knowledge about steam generation, steam-turbine propulsion, turbo-electric generation, and electrical distribution. I was the only ET aboard who usually had dirty, greasy clothing! I was unaware that this extra knowledge would be invaluable during my subsequent training in the Nuclear Power Program after transfer from the ship. I don’t remember how long after I reported aboard the ship before she went to sea, but when she did, I never became woozy or seasick. The seas were relatively calm for the week or so that the ship was at sea. No ports of call or sight of land occurred until the return to Newport. The ship would periodically put to sea for relatively short periods for group exercises or equipment evaluations. No ports of call or visits to other naval bases occurred. Only once when deployed was land visible other than when departing from and returning to Newport: when the ship was in the Chesapeake Bay for gunnery exercises. Apparently, an island existed in the bay that the Navy used for this purpose. Upon completion of the firing exercises, we were departing the bay to return to Newport. I was inside the ship when it began to vibrate slightly. I realized that the engines were in hard reverse because I could feel a reverse thrust. I went topside to see what was happening and noticed that the ship was stopped. I did not see anything near the ship and asked a shipmate on deck why we had stopped. He said that a sailboat on the other side was about to cross our bow. With hindsight, my guess is that the Officer of the Deck (OOD) was unsure of the intended path of the sailboat and decided to reverse engines to avoid a collision. Although the sailboat did not have the right-of-way, the OOD must have deduced that stopping the ship was warranted. Periodic departures from and returns to Newport were the norm for the remainder of 1967 with nothing eventful occurring. 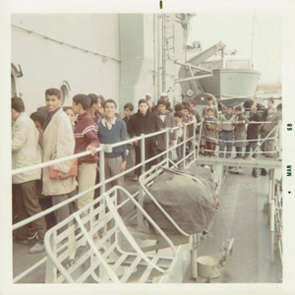 In early Dec 1967, I learned that the ship would be headed for the Mediterranean Sea in Jan 1968. I was delighted because I would finally get to foreign soil at the expense of the government. The weather in Newport had become frigid—downright brutal! Occasional snow added insult to injury. My bunk in Forward Berthing was adjacent to the starboard hull. The outside temperature at night would often be in the single digits, and its effect within the ship was evidenced on the inner hull adjacent to my bunk as ice at least 1‑inch thick! The berthing area was heated but chilly. At the break of dawn on 09 Jan 1968, the ship departed for the Mediterranean Sea. The ice in the Berthing Compartment had melted despite the outdoor temperature being harsh because the boilers became the source of steam for heating. The internal icing resulted from an apparent inadequate supply of shore steam for heating. On the next afternoon while somewhere on the Atlantic Ocean, I was comfortable in a T-shirt when outside! The captain must have chosen a somewhat southern transit across the Atlantic—maybe to dodge the cold weather. Whatever the reason, the weather would be warm for the remainder of my time aboard. After a transit time of about 9 days, the ship docked at Gibraltar for about 4 days. This city is on the Mediterranean Sea just beyond the Strait of Gibraltar. A tour was available that involved a trip to “The Rock” and surrounding area, but I did not attend. I took a few pictures of the area from the upper decks of the ship; some were through the ship’s binoculars. Gibraltar as viewed from an upper deck. 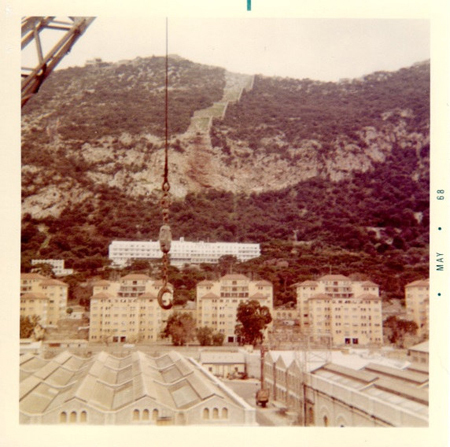 While in Gibraltar, I became involved in a situation that could have caused my demise. The ETs in the Communications Gang suspected that a connector on an antenna was defective and needed investigation. That antenna was located on the cross arm of the mast attached to the After [Smoke] Stack. Being the new person in the group and not afraid of heights, I was assigned the job even though I was with the Radar Gang. I climbed the mast to the cross arm and attached a safety line. Oral communications consisted of yelling to another person at the base of the stack. All was going well, but the situation was about to become dangerous and not because of anything related to the job I was doing. We were unaware that the Boiler Tenders had lit both boilers in the Forward Boiler Room to perform some tests. No discernible signs existed because the exhaust from the Forward Stack was colorless, soundless, and being blown away from me by a breeze from the forward port quarter. The problem occurred when the wind would blow from the bow. My position on the cross arm of the After Stack was such that I was well behind the Forward Stack and high above its outlet. Thus, I would periodically be subjected to being overwhelmed by the exhaust fumes with a breeze from the bow. Because of the distance from the outlet of the Forward Stack, the temperature of its exhaust at my location was hot although much lower than that at the outlet of the stack because of mixing with the surrounding air. The low oxygen content at my location was the issue as I would periodically become dizzy when the exhaust blew toward me. Recovery was swift when the wind shifted and blew the exhaust away from me. I soon realized that I had a dilemma: 1) remain on the cross arm and possibly succumb from a lack of oxygen before the boilers could be shutdown, or 2) with full consciousness, scurry down the mast during a favorable wind direction. The latter choice seemed to have a better chance of survival although I could fall from the mast should I become overwhelmed by the exhaust gases during the descent before I could re-attach my safety line. In either case, a fair chance of death existed because of asphyxiation or a fall onto the deck below. Also, a fall from the cross arm or mast INTO the After Stack would be deadly even though those boilers were not operating. Fortunately, I descended without incident. The task was postponed until the ship would return to Newport. Because I did not maintain a log of the ship’s activities, the following sequence of events is probably not in chronological order. But, our next port was likely the U.S. Naval Support Activities at Naples, Italy—the principal naval facility on the Mediterranean Sea. The ship would operate from this base. I turned 21 years old on 14 Feb 1968 while the ship was somewhere on the Mediterranean Sea. Curious about activities associated with aircraft target practice, I spoke with a Fire Control Technician—one of the individuals responsible for the Fire Control Radar Systems. He said that the exercise consisted of firing at an aircraft-towed target. What surprised me was his mention that the radar system had to be monitored closely during the exercises to prevent targeting the towing aircraft. The sensitivity of the Fire Control Radar was such that it would occasionally track along the towline and lock onto the towing aircraft! That conversation could have been with Frank Graham, FTG2. Again, I did not realize that he was aboard at that time until I joined the DLA. One of our exercises involved “war games” with the French Navy that lasted a few days. The ETRs stood radar watches in the Combat Information Center (CIC) during this period because additional personnel were needed in CIC. The ETRs knew how to operate the radarscopes and obtain range and bearing information of targets. Using ETRs to report target data allowed more Radarmen to serve as [target] Plotters—a task that we ETRs knew nothing about. The ETRs would simply report positions of new targets, the positions of old ones when requested from the Plotters, and the last positions of targets that would “disappear.” I learned plenty about what happens behind the scenes during those few days even though the knowledge gained would serve no purpose after mid-March because I would be transferred and become involved with naval nuclear propulsion. Anti-Submarine Warfare (ASW) exercises were common as Russian submarines posed a severe threat to our military and nation. The pictures below show the firing of a practice Anti‑Submarine Rocket (ASROC) then pulling alongside to recover it. One night while we were transiting well off the coast of Sicily during an eruption of Mt. Etna, red‑lava ejections were visible with the naked eye on the nighttime horizon. This volcano is located near Catania, Sicily, and on one afternoon, the ship anchored off Catania. We had Liberty there for the evening before departing the next morning. This was my first experience at a location where English was not spoken. This was problematic, but the first priority to overcome was the lingo for ordering booze at the bars! Aboard the ship, we were able to exchange American money for the currency in use at ports that we visited. Since Sicily is part of Italy, we were already familiar with the lira—Italian currency at that time—because of having been at Naples. While at Naples, I went on a tour that included a visit to a shop where cameo was made. That tour also included a visit to Mt. Vesuvius and one of the cities that its eruption in 79 A.D. destroyed—Pompeii. We walked inside the crater of the volcano! Steam was discharging from a few small vents within the crater. The belief then was that the volcano was dormant. Today, geologists predict that it is due for another cataclysmic eruption. I’m glad that it didn’t happen while I was promenading in the crater! Our visit to Pompeii was nothing short of fascinating. 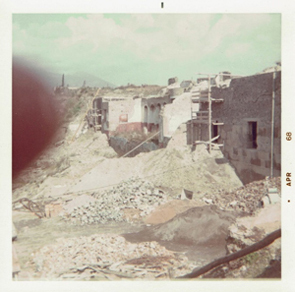 Not only was the restoration of portions of the city fabulous, but some areas were still being excavated—by hand! 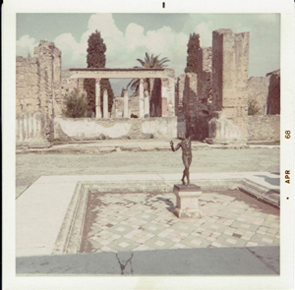 An excavated area of Pompeii. Also while in Naples, I had a bass guitar built for me. I used that guitar until 1977—5 years after discharge from the Navy—when I needed a better one. I remember anchoring somewhere off Greece. I was astonished to see that the water was crystal clear—not the bluish tint of the Atlantic Ocean and the Mediterranean Sea. Because the water depth was only about 35 – 40 feet, the anchor was visible during the day on the white sandy bottom. Liberty was not permitted. In a discussion during a DLA reunion with a shipmate who was aboard then, he mentioned that some sailors from a U.S. warship had raised hell earlier in the port city. The local government subsequently banned all U.S. sailors from the city. I have no doubt about the accuracy of that explanation! My first encounter with heavy seas occurred while operating on the Mediterranean Sea. The waves were enormous, and the ship was constantly rolling for a couple of days. The angles of many rolls were large. When looking out of a porthole at other destroyers around us, I had to look well upward or downward to see those ships that were a few miles away. In cases where both ships were in troughs, the waves between them obscured the other ship. The ability of the ship to ride those waves was evidence of its design with rigid construction to handle rough seas without any damage. 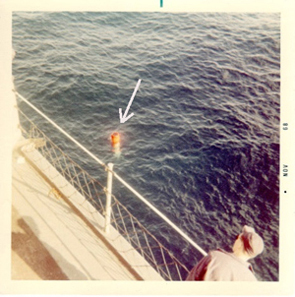 Another significant event occurred during an afternoon while refueling at sea after which the ship would head for Sousse, Tunisia (Africa)—Sonar had detected a submarine. The announcement, “Station the 1 ASW Team,” occurred in the midst of refueling. The 1 ASW Team consisted of special groups of personnel that were involved with tracking and combating submerged submarines. Stationing the 1 ASW Team outside of scheduled ASW exercises had not occurred previously. The ship was able to detect that submarine at a great distance because of its unique sonar that was being evaluated. One of its unique features was that the transducers were mounted within a giant, teardrop-shaped, 1-in. thick, rubber dome under its bow. The domes of all other ships were steel and much smaller. Immediately after refueling, the ship sped away from the oiler. Only USS Willis A. Lee and the oiler were present within the visible horizon at the time. After a while, a few other destroyers and cruisers became visible around the horizon. As they approached, I realized that they were traveling at high speed and headed toward a common location. Of the eight or so ships responding, I only remember the relatively new USS Lawrence (DDG 4) for two reasons: 1) it had the same number painted on its hull as USS Willis A. Lee, and 2) it was my first time seeing a Guided Missile Destroyer. The ships formed a large circle that revolved around a central point much in the same manner as Indians on horseback did when attacking a wagon camp of cowboys. This was the technique used to “corner” a submerged submarine. The ships maintained this formation for about 30 minutes. Suddenly, all of the ships broke formation and headed in one direction at flank speed. 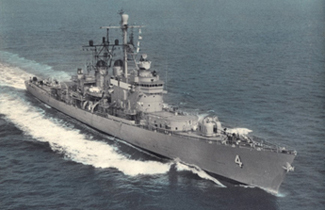 I deduced that a “chase was on.” After about 20 minutes, USS Willis A. Lee turned away and headed for Sousse. I don’t know what the outcome of the chase was. Rethinking that situation while serving my last 3 years in the Navy aboard a nuclear submarine, my guess is that Sonar had discovered a U.S. or Russian nuclear-powered submarine because of the high speed needed during the chase. The ship had not passed a small buoy in the harbor. This would not have been an issue had propulsion and electricity been available. The plan was to use combinations of slow propulsion, the Launch as a tugboat, and winches on shorelines to maneuver the ship within the harbor and into position at the pier. Without steam, propulsion was unavailable; and without electricity, the winches and anchor windlass were inoperable. Worse yet, the ship remained subject to the force of the port wind that was slowly rotating the stern to starboard—toward the buoy and pier—as the bow swiveled on the anchor. 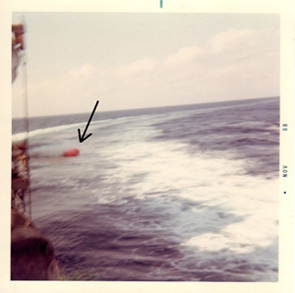 Because of confusing orders, the Launch did not take a position to keep the stern away from the buoy. The stern slid over the buoy, and the ship became entangled with it. After a few hours, divers from area arrived and found that the chain of the buoy was entangled with the starboard propeller. Later that afternoon, they cut the chain and freed the ship. Also, Engine Room personnel were able to restore propulsion and electricity. At last, the ship reached the pier. We remained in Sousse for at least 3 days. Many visitors toured the ship. I was permitted to bring a man and his wife to dinner aboard on the second day because of a friendship that had developed. The pictures below show the lines of residents. 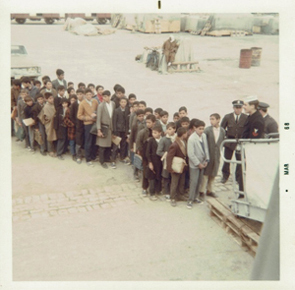 Residents of Sousse lined up to tour the ship. Upon departure from Sousse, the ship left the harbor without incident, but it would vibrate when the starboard engine would make turns at or above Ahead 1/3. Engine Room personnel deduced that entanglement with the buoy had bent the shaft, strut, or a propeller blade. Whatever the reason, we headed for Naples on the port engine alone. During the journey, sailors aboard a Russian destroyer decided to look us over. It was strange because Russian warships would often come close to U.S. warships to be observed—so close that unaided speech between personnel on the weather decks could occur. More importantly, the Russians had women aboard their ships; we were impressed! Other than getting a good look at some Russian women, nothing else exciting happened. I was transferred from the ship its upon arrival at Naples on 18 Mar 1968 and would never see her again. During one of our DLA reunions, I asked CAPT Moredock about the incident in Sousse. He described it to me as I state here but without the detailed account of events below decks. He mentioned that a blade on the starboard propeller had bent during entanglement with the buoy. The propeller was replaced at Naples without the ship being placed in dry dock! Also having spoken with other crewmates, I learned that the ship had visited Istanbul, Turkey and a few other ports while continuing to operate on the Mediterranean Sea. Thanks to my service aboard USS Willis A. Lee, I was able to visit a few foreign ports and gain knowledge that would prove to be invaluable to me both during my remaining three years in the Navy and my civilian job after discharge. Get the pdf for on-the-go reading!